Finally! The long hot summer is drawing to a close and the NFL season has begun! The majority of my Sunday nights from now till the January I will be on my sofa shouting ‘Who Dat‘ at my awesome team, the New Orleans Saints (please note – the hyperlinks will help if you are new to any of this). No football is complete without beer and some time several months ago I had a crazy idea about a beer match for each week of the NFL season. Unfortunately, down to my own disorganization and incompetence, I hadn’t quite managed to find one for every team we face but I’ll try to come up with something suitable each week to be reviewed after the game, since I am normally unable to pay attention to anything that isn’t black and gold for that 60 minutes each week. The opening game of the season against the much hated dirty birds, the Atlanta Falcons (which incidentally we won) deserved something special and I’ve been saving In The Name of Suffering (7.1%ABV) all summer long for tonight. 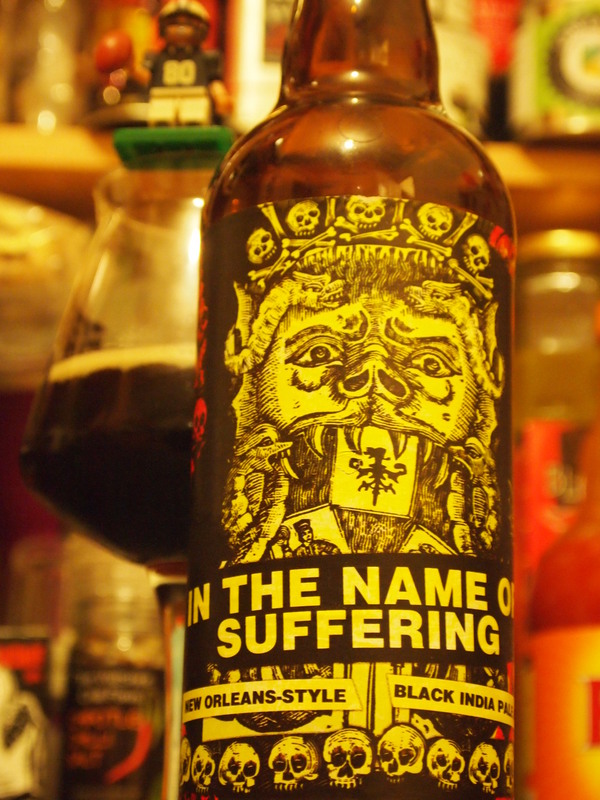 It’s tagged as a New Orleans-Style Black India Pale Ale and was brewed by Three Floyds with the New Orleans ‘sludge metal’ band Eyehategod. I’m a big fan of the BIPA style and this one seems to have been touched by a bit of bayou black magic. It’s a really deep black, only glinting with a hint of brown when held up to the light and it’s topped with light and delicate tan bubbles. The aroma is simply incredible – berries and chocolate and citrus and leather and the taste is possibly the most complex I’ve encountered in this style in a while. It starts off with a hit of sharp hops which melt into rich gooey chocolate gateaux and dark roasted coffee and big malts. There’s a lasting bitter lemon and pine at the end and although the beer is pretty thin, it’s satisfyingly well rounded and sinfully sweet, leaving you with sticky lips wanting more.